White Oak, along with Red Oak, is perhaps the most important Oak species in our Southern Wisconsin forests. The White Oak is common in our pre-settlement woodlands and can be easily distinguished from other oaks by its round lobed leaves and light, ash gray bark from which it gets its name. From a distance the tree’s bark can almost look white in comparison to other trees in the woods. Acorns on White Oak are a chocolate brown color when ripe with a shallow cap that has bumpy scales. The fruit stalk is either very short or barely stalked at all. The tree has almost bluish-green leaves when healthy that most often turn a bright red to wine red color in the fall. White Oak wood is one of the most useful woods we have in our forests. It is used for furniture, flooring, boat building, wine and whiskey barrels, and cabinetry. It is a very tough wood and resistant to water. It is reasonably priced and has qualities prized by woodworkers. Growing this species can be very difficult and for this reason is not readily available in commerce. The trees are very particular about their nutrition. It is not easy to keep good green leaves on this tree throughout the year. They often times get chlorotic (yellow) showing various degrees of nutrient deficiency. I have been most interested, in recent years, in working with various strains of this species that have superior growing capabilities. We have been advancing slowly with this work and are finally seeing some nice looking plants in the nursery. When using this plant for landscaping much attention must be paid to putting it in a rich well drained soil with a generous mulch ring around the plant. 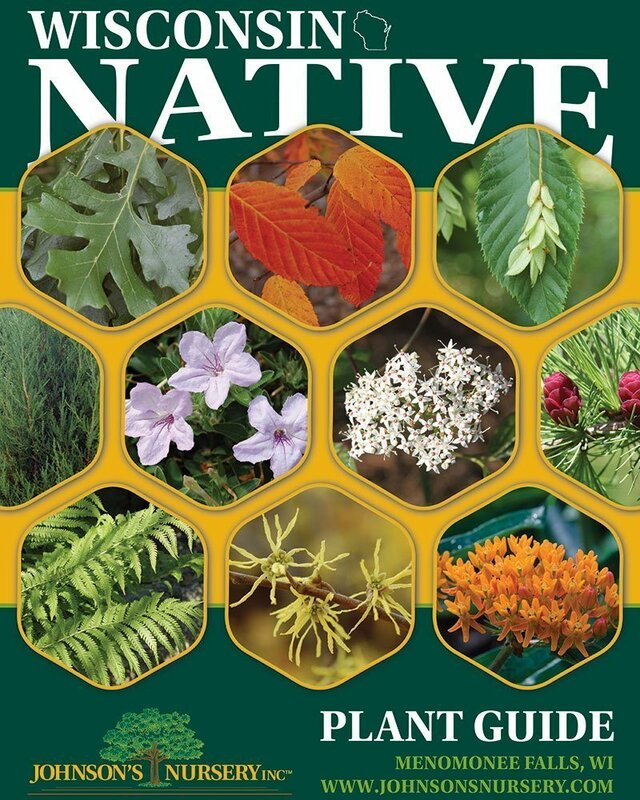 I have always thought that this was an example of a Wisconsin native plant that likely benefits substantially from having the natural soil organisms from its native environment in its root zone. Think about that when siting this plant. If I could have only one tree in my yard here in Southern Wisconsin, (This is a ridiculous hypothetical statement because I would always find room for more trees. ), it would be a Bur Oak. To me it is the tree that defines trees in our area. You can find 300 year old specimens in this part of the country. The state champion is in Dousman, Wisconsin and is nearly 100 feet tall and over 100’ across. When I stand under this tree it feeds my soul in a way that is better than going to church. Quercus macrocarpa gets its name (macro meaning large and carpa meaning fruit) from the fruit (acorns) that can be very large in this species. I have collected acorns from a Missouri seed source that were the diameter of a quarter. Here in southern Wisconsin they are typically the size of a dime on up to a nickel. The common name Bur Oak comes from the bur-like fringing on the edge of the acorn cap. The acorns are a prized food for squirrels, deer, blue jays and crows, as well as chipmunks and mice. 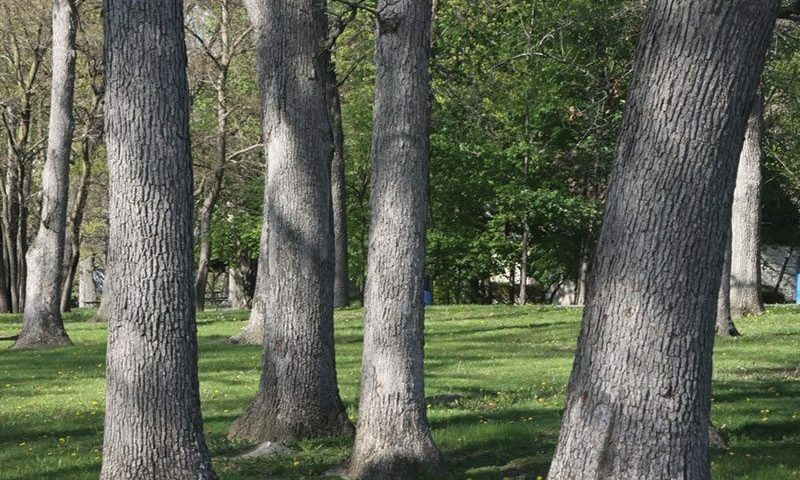 Bur Oak is a large tree that is adaptable to many different situations in Wisconsin. It can be found growing in the Central Sands region of the state as well as in the Southeast in heavy clay soils. It can be a component of the Southern Wisconsin deciduous forest and be the dominant tree species in oak savannas around the state. Because of this wide range of adaptability, there are numerous ecotypes of this species that have developed. I find this fascinating and as a result have identified several of these ecotypes for production at Johnson’s Nursery. One ecotype that grows in the woodlands near the nursery in our clay loam soils has no cork on the twigs of young trees. Another, only 20 miles away, grows in sandy soils and has distinctive corky bark. One ecotype that grows in the woodlands near the nursery in our clay loam soils of Eastern Waukesha County has no cork on the twigs of young trees. (see pic above) Another ecotype in Western Waukesha County, only 20 miles away, grows in sandy soils and has very distinctive corky bark. This savanna ecotype has likely developed this characteristic as a protective mechanism to prevent damage from prairie fires on young trees. The Eastern Waukesha County woodland ecotype probably didn’t need this protection so it didn’t evolve to have the cork on its branches. 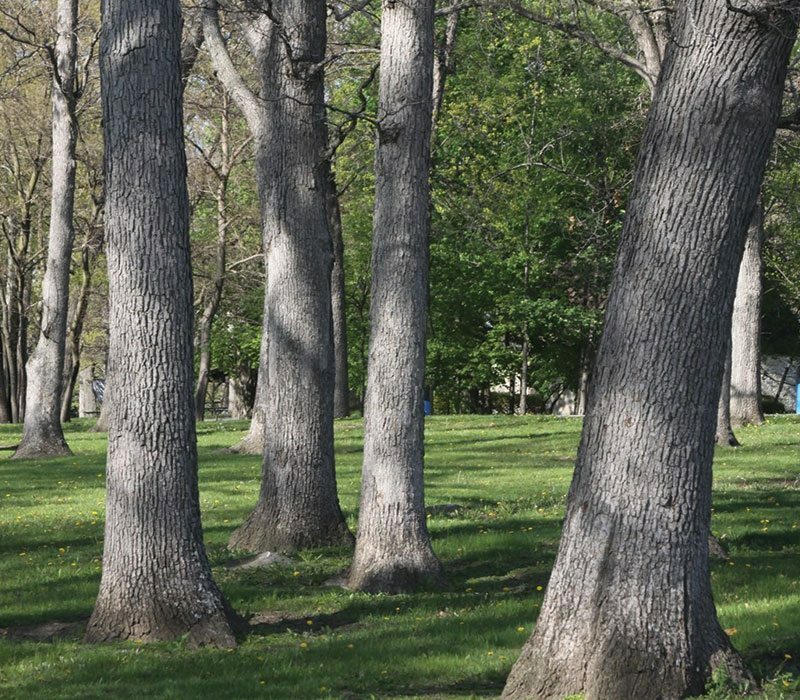 Because of its wide ranging adaptability, Bur Oak is easy to use in landscaping where space is not limiting. Customers often have concerns about the transplantability of this tree and fear that it is too slow growing. Getting a branched, transplantable root system on oaks (all species) at Johnson’s Nursery is not a major concern. 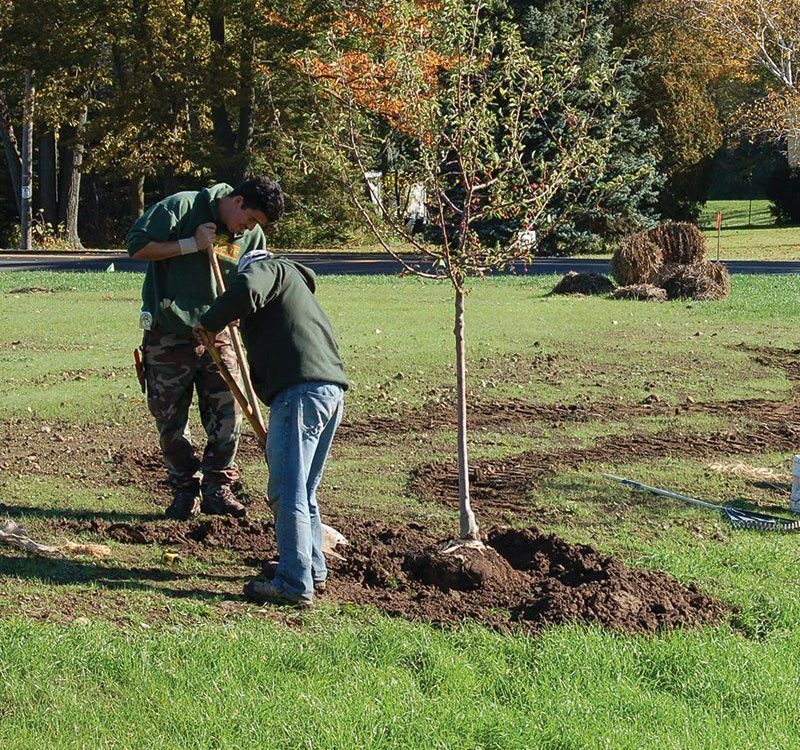 It has been an important mission of ours to improve the root system quality of oaks for over 30 years. We have accomplished this through various root culturing techniques that we use early on in the tree’s life. We no longer see any major differences between the transplantability of the oaks because of these growing practices. As far as Bur Oak being a slow growing tree, this is simply not the case, at least not from trees growing at Johnson’s Nursery. Unlike most nurseries, we collect our own acorns and grow the vast majority of our native oaks from seed rather than buying small plants (liners) from tree producers in other parts of the country. When we grow them we go through a very vigorous grading process by which we cull out nearly 50% of our crop along the way to ensure that we only have the very best seedlings to go to our fields or containers. This process gets rid of any slow growing plants or ones that have issues with our soils as relates to nutrition. So when we put a Bur Oak whip into the field to grow a B&B tree, we know that it will grow as fast as or faster than the average tree and be a salable 1-3/4” in about 3 years. 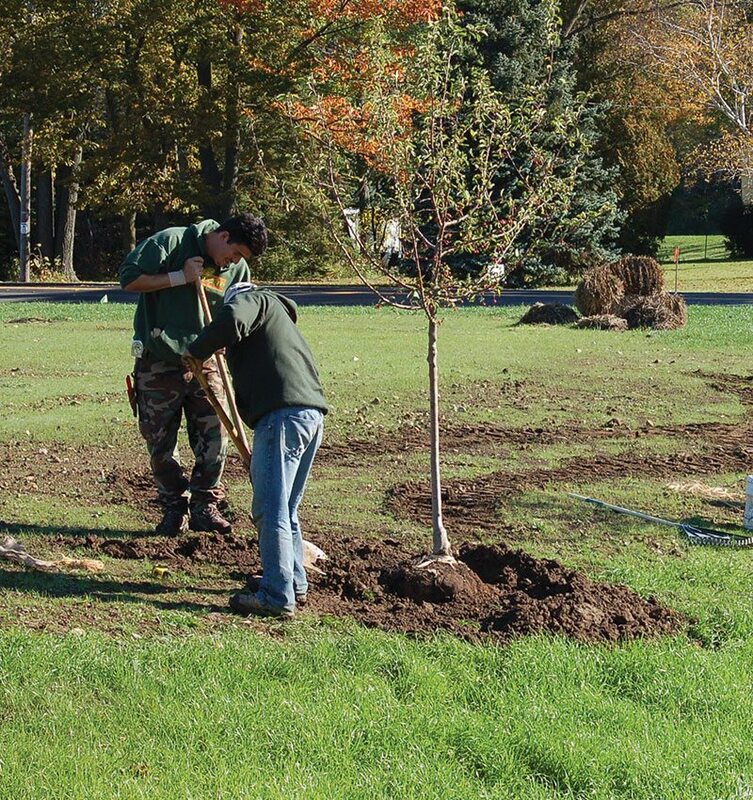 Our Bur Oaks will generally put on a foot or more of growth per year and ½” of caliper once established. 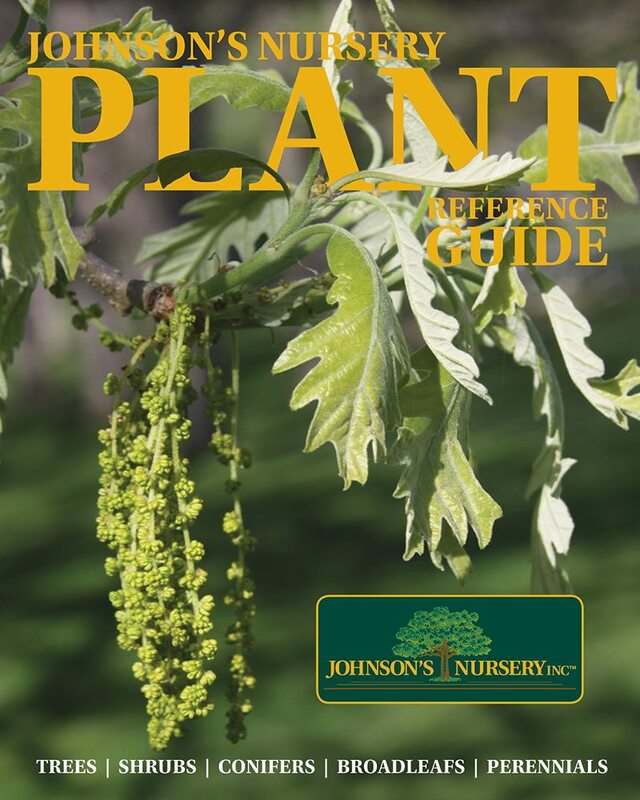 Bur Oak is not a slow growing species at Johnson’s Nursery. As the name implies this species occurs in low lying, flood prone areas in its native habitat. Near the nursery we see it growing right next to a cat-tail swamp, not far from Ilex verticillata, Winterberry and Alnus rugosa, Speckled Alder. Though they occur on slightly higher ground than those species, this should give you an idea of their tolerance to wet conditions as well as their requirement for acidic soil. One of the best ways to distinguish Swamp White Oak from other oaks is its fruits (acorns). They have 2-4” long fruit stalks (peduncles). The acorns are usually polished-looking and have a light brown to tannish color. Leaves on Swamp White Oak are a dark green above and white to grayish green underneath-thus the name Q. bicolor. One of my favorite things to look at to distinguish this species from others is its peeling bark on 1.5” to 2” branches up in the canopy of the tree. The peeling bark is brown and the under bark is a whitish tan. It is really quite interesting. Swamp White Oak wood is used for many of the same purposes as White Oak but is generally considered of lower quality because the wood has many more knots in it due to the trees habit of holding onto dead branches. Swamp White Oak wood is used for many of the same purposes as White Oak but is generally considered of lower quality because the wood has many more knots in it due to the trees habit of holding onto dead branches. This species’ acorns are an important food source for ducks, turkeys, deer, and various song birds as well as other animals. Swamp White Oak has been a favorite for use by municipal foresters in our area because of its ability to transplant easily. It probably has the most fibrous root system of all of the native oak species we grow. However, getting a fibrous root system on oaks (all species) at Johnson’s Nursery is not a major concern. As was explained earlier, our root culturing and grading practices eliminate inferior trees with unacceptable root systems. So when it comes to Swamp White Oak, our biggest concern has become the species’ tolerances to alkaline soils. Because the nursery has pH values ranging from 7.2 to 8.0, trees of this species will often times become chlorotic (yellow) under such conditions. It is for this reason that we have targeted specific mother trees both in the nursery and in the wild that produce alkaline soil tolerant seedlings for securing our acorns. We call this screening for alkaline soil tolerance. When it comes to Swamp White Oak, our biggest concern has become the species’ tolerances to alkaline soils. What we have found is that many of the alkaline soil tolerant mother plants are hybrids of Swamp White Oak and Bur Oak, Quercus x schuettei. However, when the average nurseryman or plant person looks at these young Q. x schuettei trees, the majority of professionals are unable to distinguish them from a Q. bicolor. They really look similar to each other. So, if you are working in high alkaline soil conditions and want to use Swamp White Oak, consider switching your specification to the more alkaline adaptable Quercus x schuettei. You will likely have better success with your plantings. Quercus muehlenbergii is a very distinct looking oak. Its leaves resemble those of a true chestnut (Castanea dentata) with a coarsely toothed margin. (see pic below) Each tooth curves in slightly and comes to a point. The foliage is a lustrous, dark green or yellow-green on the top surface and whitish below. The acorns are typically small in comparison to our other native species, usually being less than .75” long. They turn a yellowish color as they ripen and develop dark brown vertical stripes as they mature, eventually turning a rich, dark, chocolate brown color. Like most oaks, they don’t bear heavy crops every year. However these are more unreliable for fruit bearing than almost any of the oak species we grow. It is only about once every 6 or 7 years that you get a bumper crop to the extent that you can pick them up off of the ground. You typically have to use equipment to get up into the trees and pick them before they fall. If you don’t do it this way, the many connoisseurs of these low tannin acorns will eat them before you get a chance to harvest them. Squirrels, chipmunks, mice, blue jays, crows, and deer all love these nuts. I think they prefer them over anything else. They must taste really good. I have tried them myself, one time, and was not impressed. I am not a full blooded squirrel though. I must not have the right taste buds or need to prepare them in some special way. I need to do a little more research. One of the most interesting things about this tree is its adaptability. It is native over nearly the entire Eastern U.S. from Vermont to Georgia to Texas and up to Minnesota. In addition there are populations of this species native as far west as New Mexico and even into Mexico itself. No other oak in the North American flora has a range so extensive. The tree thrives in inhospitable sites as well as pristine woodlands. Kentucky is where it is most magnificent. The national champion Chinkapin Oak is 110’ tall by 92’ wide in Clark County, Kentucky. Chinkapin Oak is a calceophile, meaning it loves high pH soils. I think this tree has tremendous potential as a street tree. I really like its adaptability and the fact that the acorns are small and animals will clean them up. The tree has a moderate to fast growth rate. 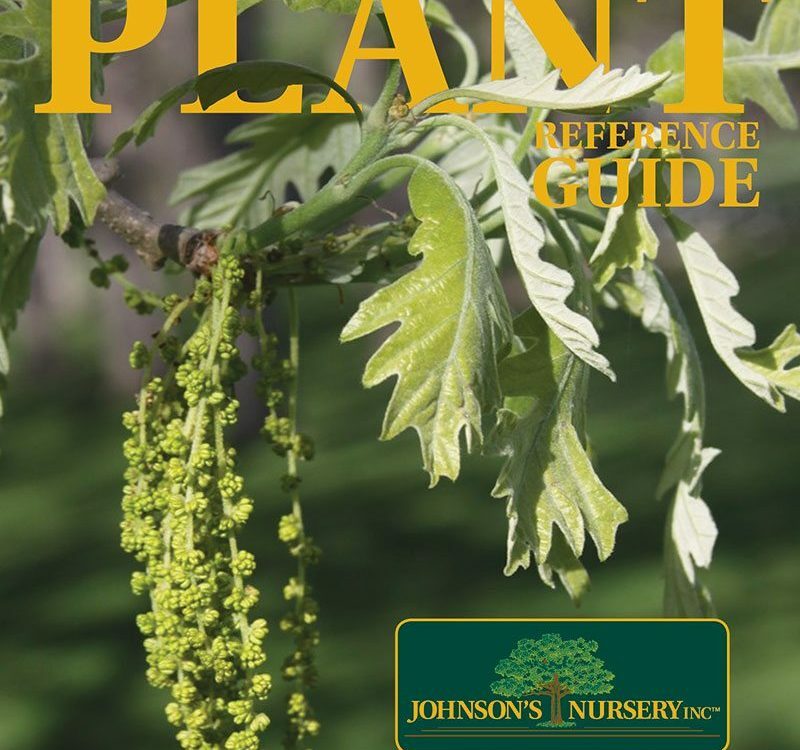 Chinkapin Oak is the rarest of the native oaks that we grow at Johnson’s Nursery. It is listed by the State of Wisconsin as a species of Special Concern because of the low number of plants in the wild. 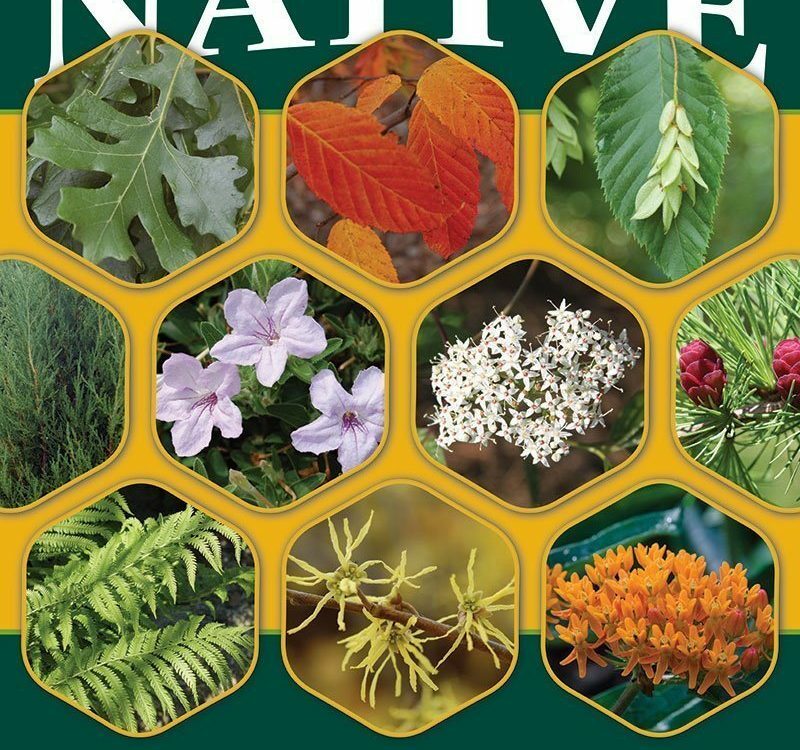 There are native trees in the Southeast and Southwest portions of our state. Those in the Southwest seem to be more widespread, whereas in the Southeastern part of the state they seem to be spotty in their distribution. Pre-settlement trees in the Southeastern part of the state seem to be located only at old Native American settlements. My personal theory on this is that the Native Americans brought the trees to the Southeastern part of the state when they moved here from points farther south and east. I suspect they brought acorns here with them. My reason for hypothesizing this is that when I grow seedlings from acorns of the various pre-settlement trees in SE Wisconsin they show dramatic differences in hardiness from each other. They actually behave like they are from further South. They don’t harden for winter as early as I would expect for an oak that would have evolved in our area over a long period of time. Plants from the southwestern part of Wisconsin don’t behave like this and seem to be perfectly hardy and suitable to our area. I suspect the Southwest Wisconsin populations have existed in their area for eons and evolved in that place while the pre-settlement trees in the Southeastern part of the state are relative newcomers. Many of them likely spent the bulk of their evolutionary lives further south.